​Makayla, a 15 year old teen, entered a Neighborhood Studios' graphic design class. She was attending a charter school for youth as she had been struggling with the traditional public school environment. She liked to draw, but didn't see a future in it. She immediately latched onto the design classes and digital photography. The teacher was a great role model. He was a professional photographer who could explain the career in a very straightforward way. He was also very supportive and knew how to encourage this student to get the best photo and best design possible. She was determined to pursue her talents. With encouragement and support of Neighborhood Studios faculty, she applied to and was accepted by the Rochester Institute of Technology as a Graphic Design major. She has since received her Bachelor of Arts degree and is continuing her students at RIT toward a Master of Arts degree. ​As part of their therapeutic plan, two youth were referred to the Conservatory. John was described as having anger management issues – he would often have fights in school. The other, Roberto, was labelled as a suicide risk. He had few friends and was always very negative about himself. The two young men attended the Conservatory program throughout the year. John was quickly struck by the way kids were treated differently at Neighborhood Studios. If there was a problem, youth were encouraged to leave class and talk with faculty and then were reintroduced into class in a consistent and respectful way. John revealed that he was getting into fights because he was defending kids who were being bullied. He thought he was the only one who could stand up for them. John quickly became one of the most responsible youth in the program, taking on leadership and volunteer roles. While his art skills were very basic, his postcard design was selected and used by a local art gallery to promote an upcoming art show. His sense of self-worth and confidence soared. It was discovered that Roberto was actually incredibly talented in art. He had never had an opportunity to show others his skills. When he started drawing in class, the other students were amazed and gathered around him to watch. He quickly became the most popular student in the class. Despite many other barriers in their lives, both youth graduated high school, and moved with a better understanding of their contribution. ​​Thomas, a youth with significant disabilities attended Camp Hart with a full-time aide, as well as support from a physical therapist and an occupational therapist. Thomas had limited communication skills which often caused him to be isolated from his peers. Neighborhood Studios faculty soon discovered that Thomas loved to tell jokes. With their encouragement, the other youth, especially the younger ones, engaged with him to hear his jokes. Older youth would help him by pushing his wheelchair when transitioning from class to class. All the youth would help him with art projects or dance with him in movement class. As a participant in the end-of-summer performance, Thomas took center stage and told several of his jokes to the delight of the audience and especially his parents. The huge smile on his face indicated Thomas' sense of pride in his accomplishments and self-worth. ​This summer, a 14 year old youth, Kayla, was referred to Neighborhood Studios from the Department of Children and Families. She was very distant and did not trust going into any type of program. She was known to love music, but did not play an instrument or sing. Her social worker recommended that she enter the Conservatory though suggested that she may just be in the room and not participate. During her interview, Kayla revealed that she liked to draw. She was placed in the art class. She was reticent to participate and said she “couldn’t draw.” The teacher and director gained her trust through conversations about her interests. The teacher told her, “Don’t worry. We will work together and I’ll show you what you need to do to make a great portrait.” A relationship developed. Kayla took a chance. She followed the teacher’s lead and instruction. She started to participate and produced an excellent portrait. Buoyed by the positive reactions to her first piece, she attempted a second…and a third…then a fourth! She produced four portraits, three of which were sold at the end-of-summer art show. More importantly, Kayla ended the summer with a different outlook of herself and future. She continued at Conservatory this Fall. 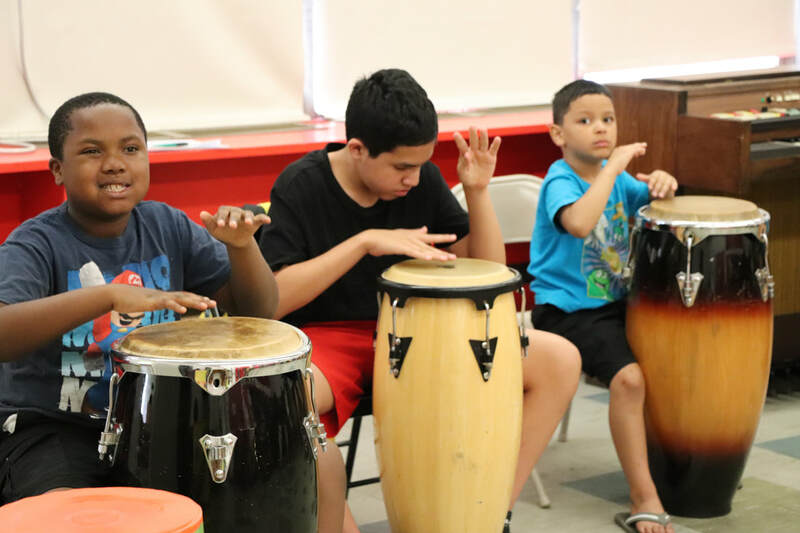 ​Eleven year old Michael, living in a residential program, was referred to Neighborhood Studios’ summer program as part of the overall plan to transition him back to his home. However, there was speculation that he might not yet be ready and would, in fact, need to return to the residential placement at summer’s end. Michael was enrolled in Camp Hart. At first, he did not participate in activities. He kept his headphones on and was distant. Gradually the staff, without pressuring him, encouraged him to interact and engage with the other kids and adults. He slowly warmed up to the experiences and even started to have fun during art, music, and recreational time. By the end of the summer, Michael participated in the final performance playing drums. His parents were so delighted to see him participate in the show. And, his social workers recommended that given his progress, it would be appropriate for him to return to his home. Michael continues to be part of after-school art classes at Neighborhood Studios.